Later this year marks our 5 year anniversary at Mac Mini Vault. We’ve been working on a new website design and wanted to launch it in a big way. In the past 5 years we’ve had many fun projects like our Apple TV Webserver and telling our story in a video. 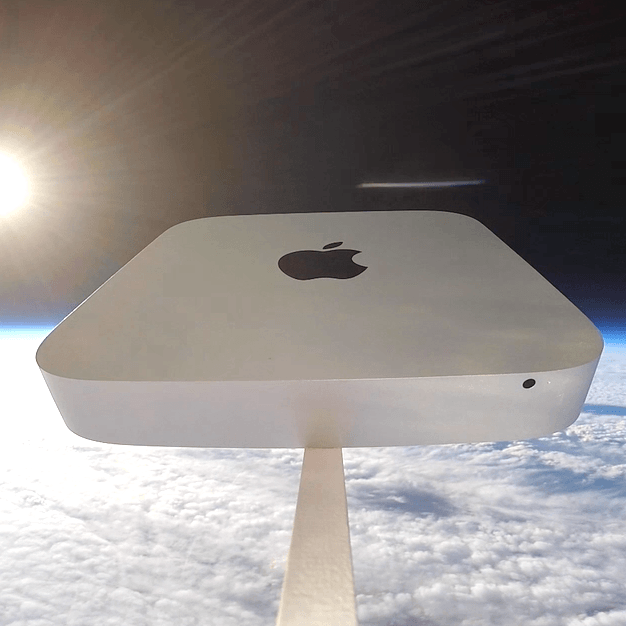 Almost a year ago we had the idea to send a Mac mini up above 100,000 feet for some great photos and video shots. After extensive research we partnered up with John from nearspaceballooning.com. Our goal was to launch near our Phoenix, Arizona data center. There would be many complications trying to launch near Milwaukee, especially in the winter months. Our scheduled launch date was February 22, 2015. The wind speeds were higher than normal and forced us to readjust our plans. We started with a desired landing area and the modeling projections pushed our launch area out to the Colorado River. At 3:30pm (MST) the Mac mini payload was launched outside Blythe, CA right on the bank of the Colorado River. We started tracking the payload as we drove out to Wickenburg, AZ. Right around the time the sun was setting we received the signals confirming the landing coordinates. Luckily it landed near a trail that branched out from a highway. We reached the trail as the sun set and spent about an hour off road in the dark and to find the payload safe and secure. The cameras were still running. We successfully sent a Mac mini up to 111,998 feet. we did have to remove most of the internals of the Mac mini.